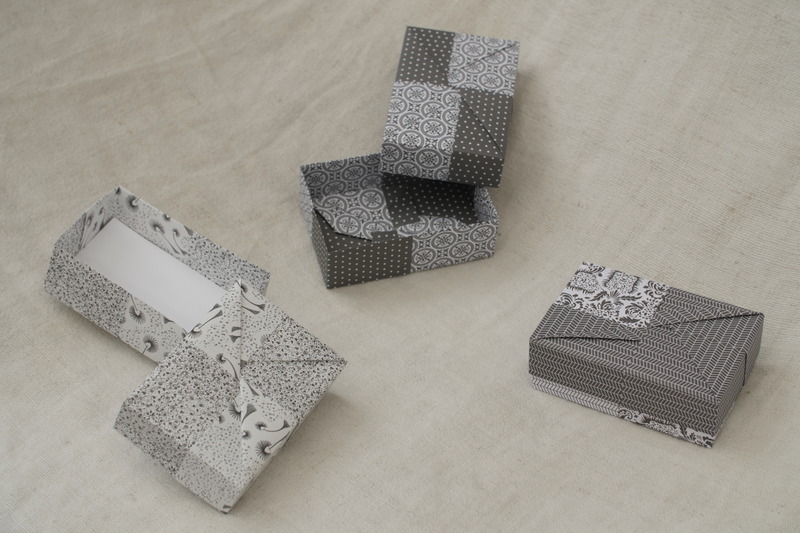 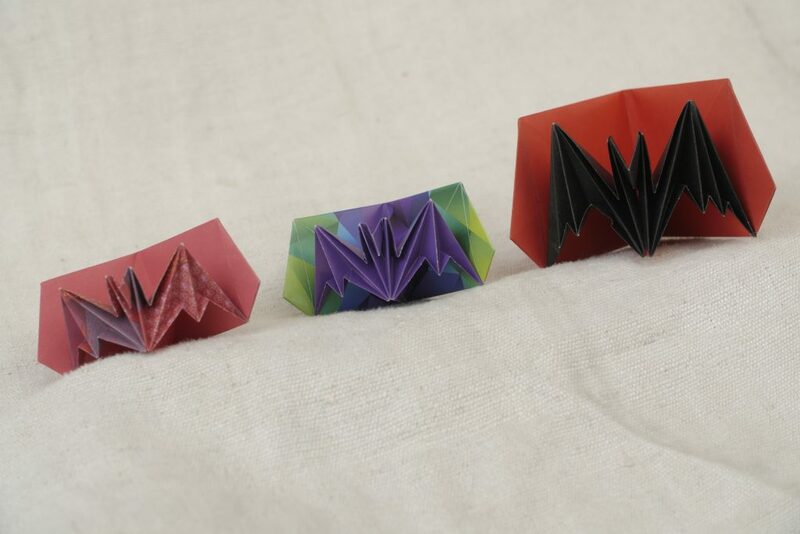 The diagram for these boxes can be found in “30 boîtes en origami”, as mentionned before. 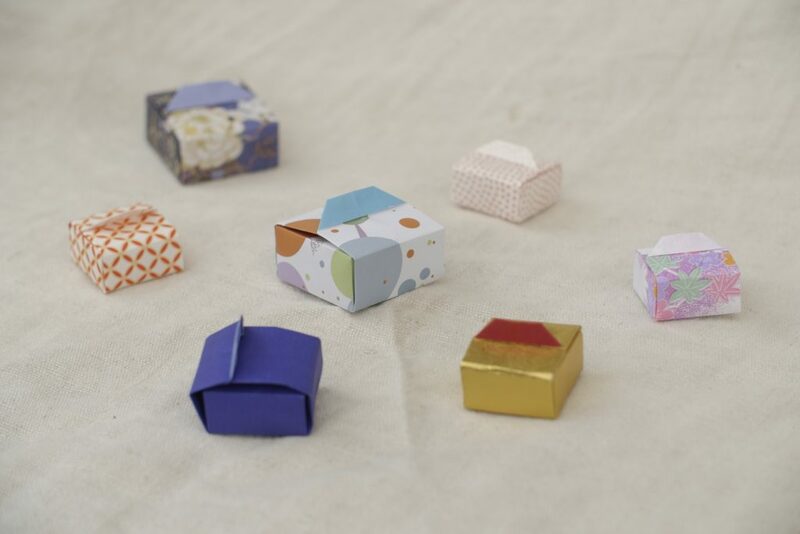 Each box requires 8 square sheets (4 for the lid, 4 for the bottom). You can see I really like folding the model, I made so much of them (and more, that I gave away before taking the pictures). 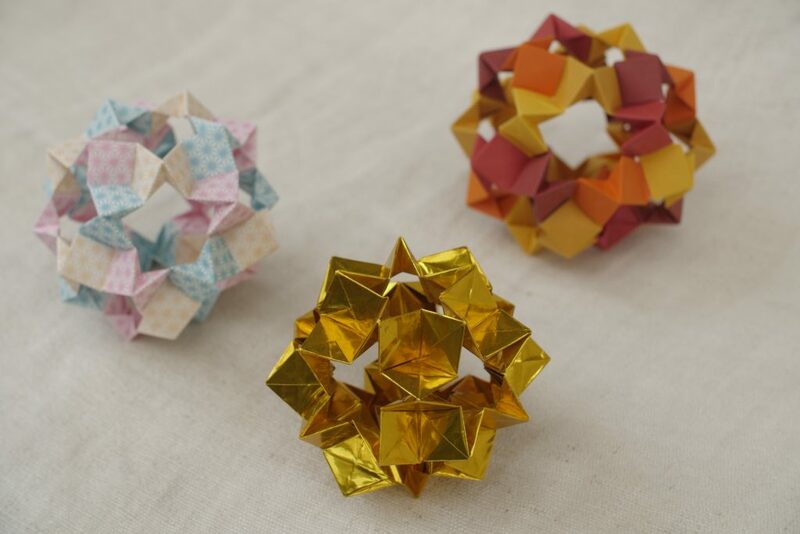 The three boxes above are made from: leftmost, 7.5 cm kraft paper; top, Showa Grim washi chiyogami 15 cm; right, japanese chiyogami and Tant 15cm. Papers: left, Aitoh RobinJoyRiggsbee pencil drawings + white Tant for the interior ; middle, Vivi Gade “Paris” paper ; right, Dovecraft “Back to Basics” Monochrome (150 gsm), all in 15 cm. 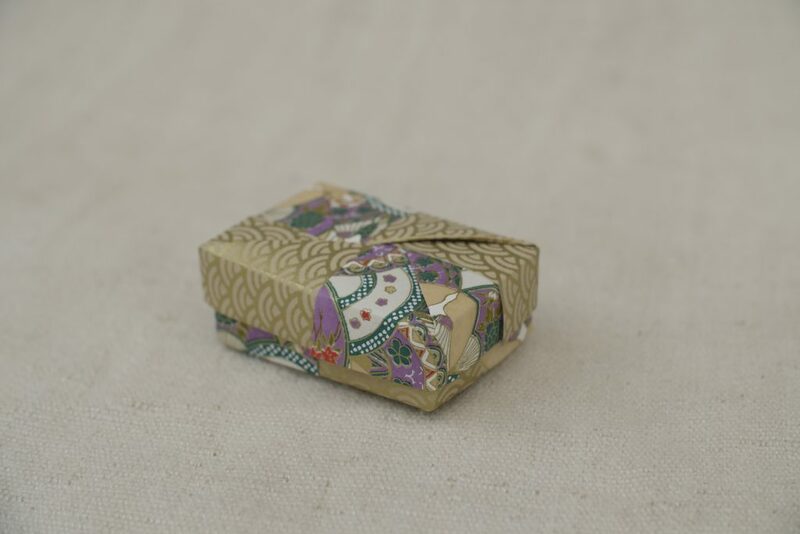 Papers: middle, japanese chiyogami 7.5 cm ; left and right, 15 cm japanese paper (all is in japanese on the box, can’t give details). Tomoko Fusè is probably my favorite origamist, she invented so many incredible models – and this is one of my favorites. 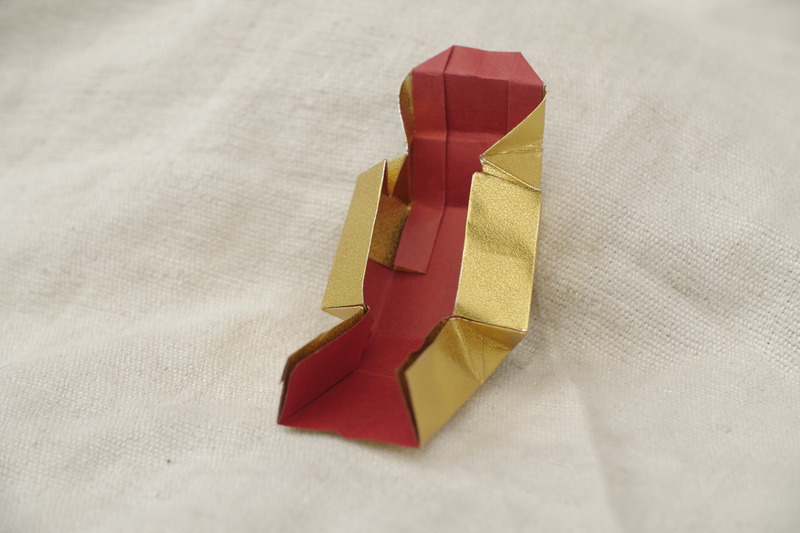 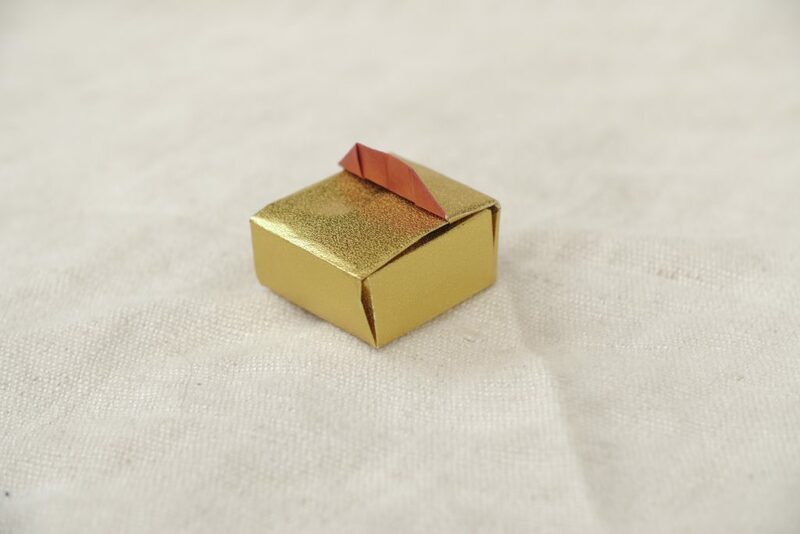 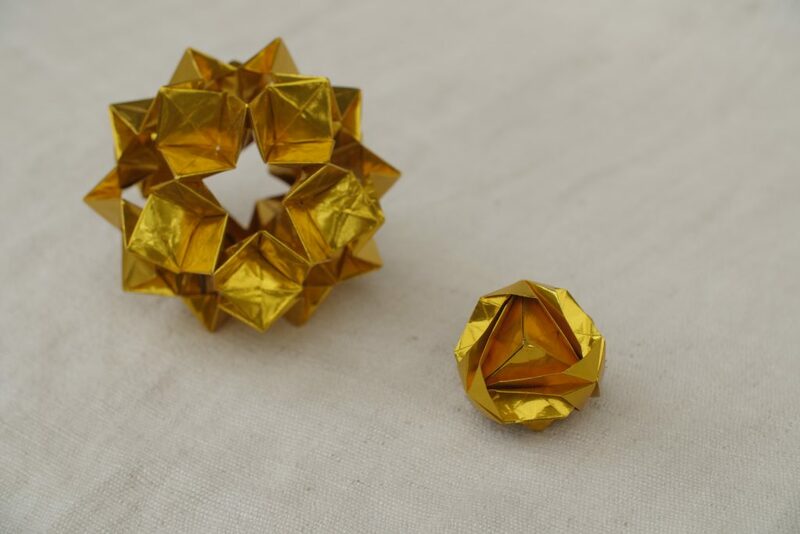 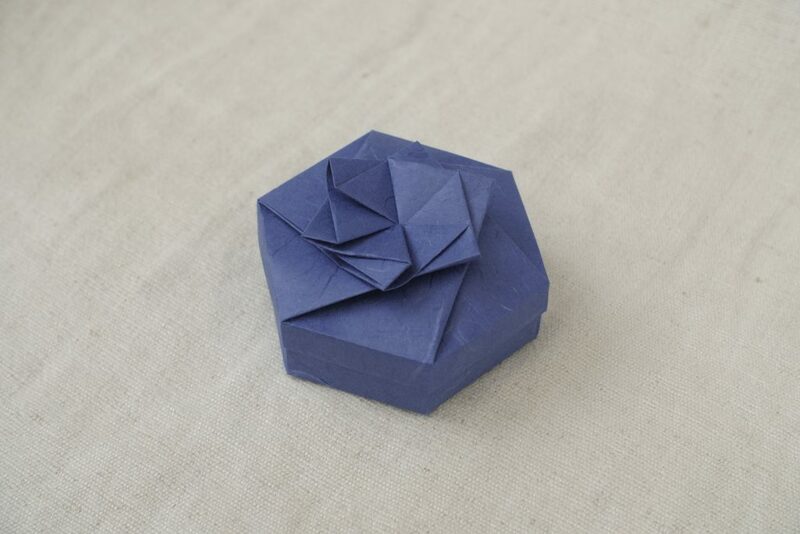 It is found at the end of “30 boîtes en origami”, as mentionned before. 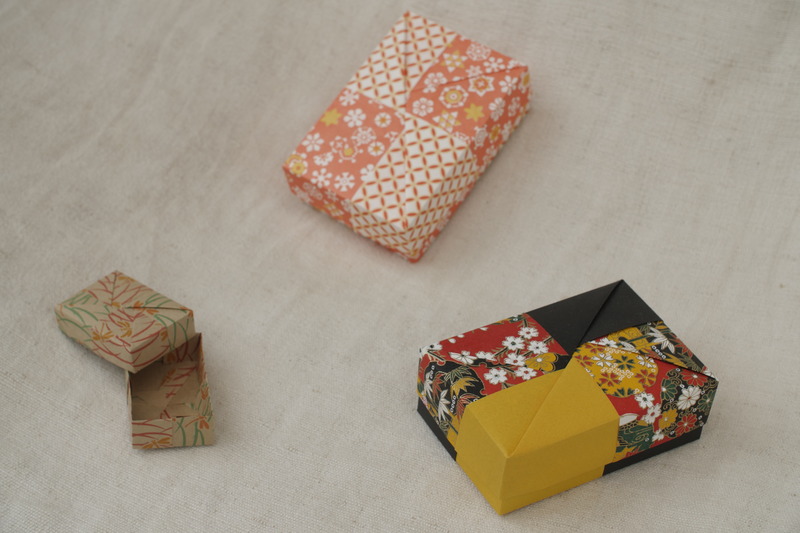 The hexagonal boxes are folded from 4 sheets (2 for the bottom and 2 for the lid). 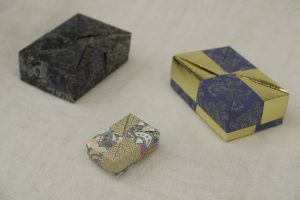 The blue box is made from two A4 sheets cut in half, the two others are made from square paper (japanese chiyogami + Tant for the pink one, don’t remember the blue waves paper). 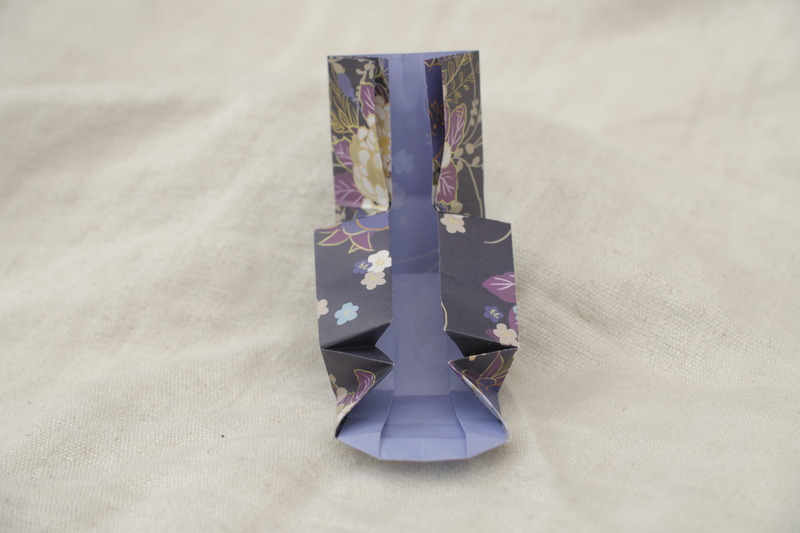 So, one thing I really like with this model is that it works for any rectangle. 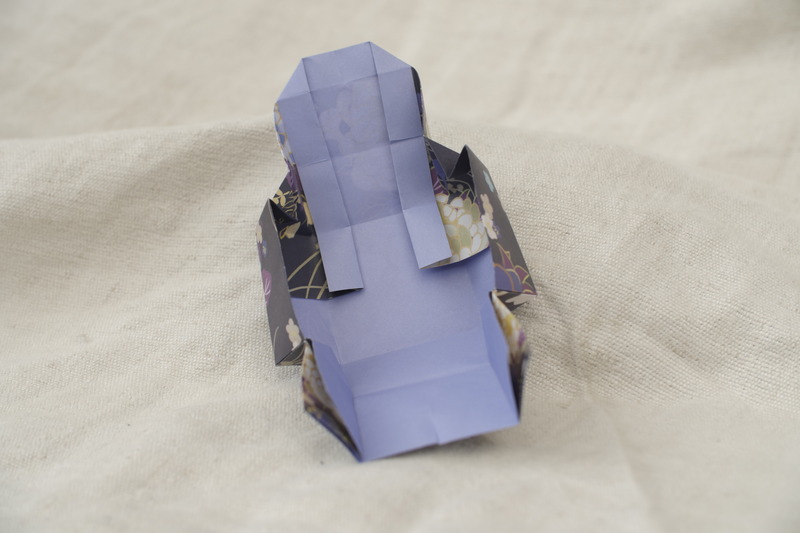 Whatever your favorite paper format, or what you have available: you won’t have to cut! 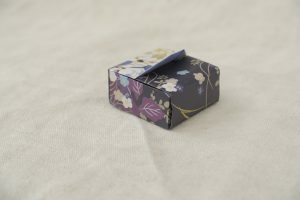 I bought this gorgeous paper in a papershop in Rennes (France), there are beautiful fibers in it that give a texture that I like. 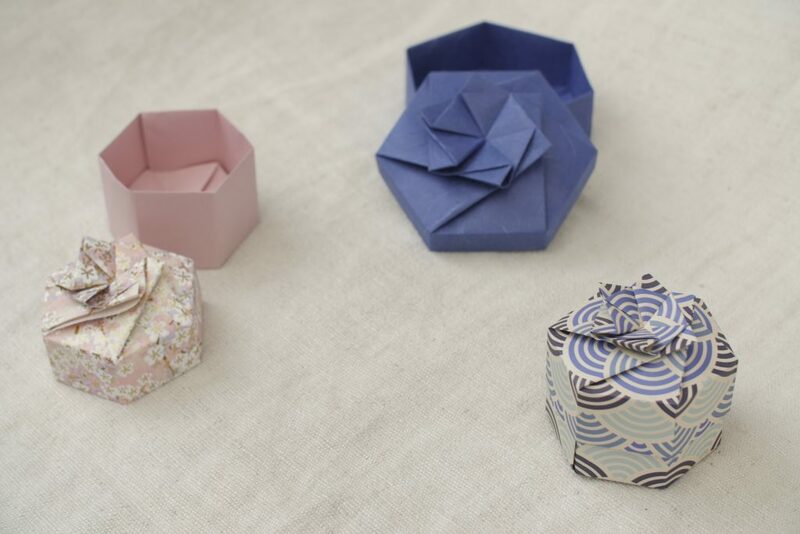 The boxes are formed with a twist fold, a bit hard at first but sort of addictive :) You can make a number of variations on how to arrange the “flower” on top of the box.